The first day of eating only Norfolk food and drink is going rather well. So far. My usual weekday winter breakfast is porridge, but having not yet sourced any Norfolk oats, I stopped in Holt on the way to work to get some bread. 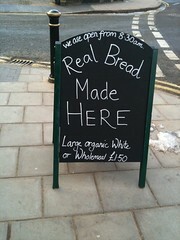 I’d noticed a sign outside The Owl teashop saying that they bake “real” bread and, as it turned out, they certainly do. 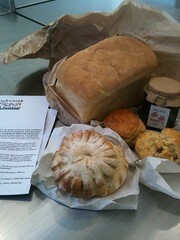 I chose a still-warm large loaf and then decided to have a rather cute looking cottage loaf – half roll half loaf – a couple of scones and a pot of their home made raspberry jam. Whilst I was being served a chap called Dan brought another couple of loaves through to the shop from the back and I guessed he was the baker. Half an hour later, once I’d got our pork pies into the oven up at our kitchen, outside Holt, I was just settling down to enjoy some of the still-warm cottage loaf with jam when Norman, the recently retired baker from North Elmham, rolled up, all unexpectedly, in his van. Over a cup of coffee it turned ot that Norman had actually been with Dan on Saturday and the Owl Bakery was having some of his equipment from Elmham and the loaf I’d bought had more than likely just been baked in a North Elmham tin. It did feel a bit more than a coincidence that I’d suddenly found myself drawn to The Owl. Positively spooky. Anyway. Very nice bread. I’m planning on going there a lot. Lunch was sort of skipped as we’re working on developing a new Bray’s Cottage line and I ended up eating quite a bit, in the spirit of research. But it was definitely all Norfolk! 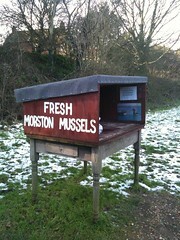 Before heading home, I grabbed a bag of Morston Mussels, on a bit of a whim, from the honesty box on the way into Cley. I would normally cook mussels in white wine or possibly cider, and although people do produce both in Norfolk, I just didn’t have any at home. But, after a bit of a consultation on Twitter, I’m going to cook them with finely chopped onion, parsley (just excavated from beneath the snow in the garden), garlic, apple juice, mustard and probably a dash of Norton’s cream. The only non Norfolk ingredient is the garlic. I’m going to put garlic on the exceptions list, although a Cromer friend has told me that he still has some of his home grown garlic that he can let me have (we’ll do a pie swapsie) so garlic may be just a temporary visitor to the exceptions. I’m thinking that I haven’t had enough fruit and veg today, so I’ll cook some apples to have as dessert and work on doing better tomorrow.